At any rate, Irving struggled mightily against the Wolves in the game at Cleveland, turning the ball over 9 times, several of which came down the stretch as the Wolves mounted their comeback. So far, Irving doesn’t look suited to playing the LeBron James role in Mike Brown’s one-on-five (non) offensive system. 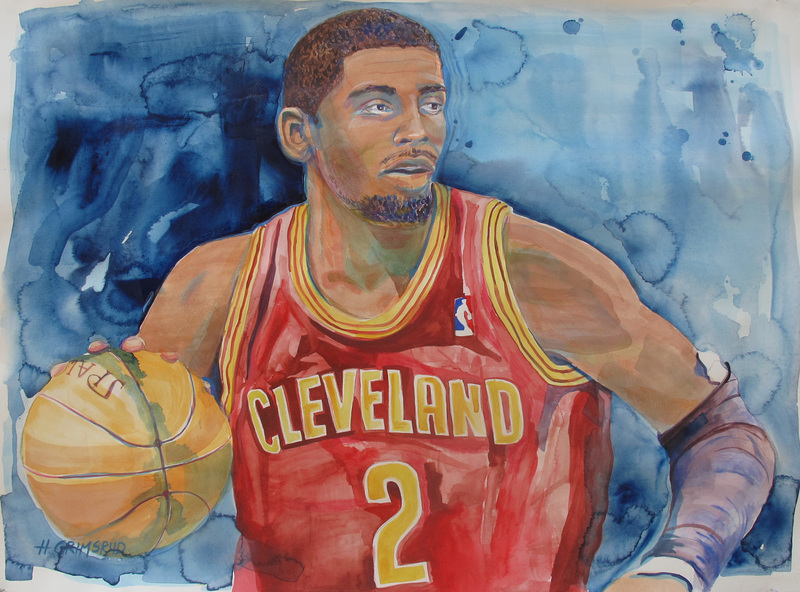 That pretty much captures the problems with Mike Brown’s offensive coaching “philosophy.” Anyway, Kyrie “Lee” Irving is still our boy, as evidenced by the custom artwork hanging in my NBA TOC. First thing’s first: It feels odd to note this, but in the loss to Cleveland, Anderson Verejao’s size, strength, and lateral quickness gave the Wolves’ Paul Bunyan-esque center Nikola Pekovic absolute fits, and effectively rendered Zod completely ineffective on both ends. Look for Cavs coach Mike Brown to give Verejao heavy minutes tonight when Pekovic is in the game, especially if Zod gets off to a quick start and is scoring around the rim on the Cavs’ (still) out-of-shape starting center Andrew Bynum. Second: Tristan Thompson, who’s much larger in real life than he appears on television (but just as ambidextrous) , did a very nice job defending Kevin Love in Cleveland. Love wasn’t making three-pointers that night, and Thompson’s length and strength took Love out of his usual interior battle rhythm of making easy jump hooks and baiting defenders into fouls. Love finished with 17 points on 8-20 shooting–a subpar night by his usual MVP-candidate standards. Third: Even though Andrew Bynum didn’t put up particularly impressive box score numbers against Minnesota in the game at Cleveland, no one–including Pekovic–was strong enough to keep him from getting good looks very close to the basket. Bynum is simply a massive, massive human being. And he has fairly good touch around the hoop. Gorgui Dieng collected three fouls in three minutes, and if memory serves, they all came in trying to do something–anything–to stop Bynum. Michael Olowakandi–a human-being (former) basketball player almost Bynum’s size won’t be walking through that door (Eds. Note: Thank god. )–so keep a close eye on how the Wolves try to counter Bynum’s presence if he’s playing aggressively tonight. On all three two counts, adjustments will need to be made tonight for the Wolves to give themselves a good shot at winning. Will a Better Alexey Shved Please Stand Up? Most of the damage came in the second quarter, at Alexey Shved’s expense, prompting Wolves POBO Flip Saunders, who was in attendance that night, to post this embarrassing in-game tweet. I’ve been a card-carrying Shved fan since before he played his first game as a Timberwolf, but I can be counted among the many who now agree that Alexey needs to sit. Rick Adelman should never, ever, allow Shved to guard C.J. Miles again. The carnage was devastating. I’d prefer to see Shabazz Muhammad given a chance in Shved’s place, and if he’s a step slow defending burst guards like Miles, then I’d put J.J. Barea on him (if for no other reason than that J.J.’s mind games might throw off his rhythm), while A.J. Price would match up against the opposing team’s point guard. Tonight, that would be Jarrett Jack, whom J.J. defended well in Cleveland despite a substantial height differential. Whenever Shved gets his head right and deserves to rejoin the second team, it should be as the point guard, with J.J. free to roam and shoot as he pleases from the two. 1. Shabazztastic Birthday: I saw this on the Twitterz and wanted to wish a happy bday to Punch-Drunk Wolves’ favorite Wolves non-rotation player, Shabazz Muhammad. We can’t be entirely sure how old he is today, nor do we care, but we’re confident he’s younger than 27 so he still has time to grow into an NBA role. 2. Hazing: Shabazz is probably also breathing a sigh of relief since new rules should prevent his teammates from hazing him. 3. Budinger goes to the doctor: Injured small forward Chase Budinger is reportedly seeing a doctor today for a checkup on his injured knee. There’s still no definitive timetable for his return. But whenever it is that that return happens, the Wolves’ bench should improve markedly. That’s all folks. Enjoy the tilt. 1) I’m already locked in for a 113-95 revenge win prediction. 2) Pek wouldn’t need the axe. 3) Ouch! PD favorite Anthony Bennett not even mentioned. Not trying to rub it in, but this has been one of the weirdest (worst) career starts in memory. Hehe, I was wondering if anyone would pick up the (lack of) Bennett coverage here. I still think he’s going to be a nice pro, but probably not this season. The size and skillset is pretty impressive, but he’s in a weird situation, being behind Thompson, coming off his off-season injury, and in trying to figure out how to get buckets in Mike Brown’s stank-leg offense when he’s often left to stand around and watch while Kyrie goes one-on-five from the top of the key. I’m not trying to say that he hasn’t had some bad-looking moments or that he has been productive in any way so far, but I’m waiting to reserve final judgement. My best rebuttal to Bennett Bashing is to remember how crappy Kevin Love looked in his first few NBA appearances. It might be months if not a couple of years before he stars in the pros. 1. Your memory is wrong about Love. He was decent from the get go. Had a few stinkers like any rookie, but was somewhat productive from his first game. 3. If it’s a couple of years (as you suggest it might be) then it was a poor use of a #1 pick, inarguably. The first time I saw Love was in his first appearance at Target Center. He scored something like 2 (or 0?) points and had his shot blocked 7 or 8 times. Reusse devoted a column to the Mayo trade based on just how woefully overmatched our new guy was. He improved pretty quickly though. You’re right on (2) since it’s an anecdotal example of one guy who got way better over time. But in the one-and-done era, initial impressions don’t matter too much. 3 you are just plain wrong on. Inarguably. 1. The first (regular season) game Love played at Target Center (or anywhere), he scored 12 points and had 9 boards in 18 minutes in a win, leading the team in +/-. Opening night, 2008. As for 3, upon reflection, I was too certain. If he actually becomes a true star, then 2 years is not necessarily too long to wait. Obviously we’re a long way from knowing one way or another what his ultimate level is. Still, I know you guys loved him, but the risk factors were pretty high for a #1 overall pick. He was certainly off to a better start to his career than Bennett is (which isn’t saying much). When Wittman would actually give him minutes, he developed a nice chemistry with Al Jefferson. But there were some ugly games in there too. His rebounding was always top notch. I just wasn’t seeing a player that would develop into (anything close to) a 25/15/5 MVP candidate. If others did, more power to them. I remember thinking Love’s future would be like a 15 & 12 guy that would struggle on defense once he played for good teams. As for waiting 2 or 3 years, it doesn’t always seem to be necessary (Davis, Irving) but there are some examples like Paul George where it took a few years to reveal a superstar-caliber talent. Again, not evidence that this will happen for Bennett, just that one-and-dones can take a while to find their way. The opposite case was Wesley Johnson, whose advanced age made his early struggles so much more alarming. I’d at least like to see 20 or 30 games (with real playing time) from Bennett before beginning to develop an opinion on his NBA career. Best to sub in JJ to play the two with Rubio. And then rest Ricky and move Barea to the point and experiment at the two position. Wolves need to takes risks at the two. The risk is limited considering Martin’s shooting production. Find out who can play. I agree–it’s just a question of who can fill the spot Shved is currently in. There’s no natural fit, but given that it’d be hard for any reserve to “out-bad” Alexey at this point, there’s room for experimentation with either Shabazz or Price, in limited stints, with little risk of harm. Pretty sure no Bynum tonight. I think that’s right (unless something has changed). Not sure whether that helps or hurts our chances–Verejao is a tough matchup for Pek, and doesn’t give up any of the easy rebounds that Bynum is too lazy/poorly conditioned to go after.